This unique destination fly-out to the most southern borders of Europe is actively supported by Aviasport and Aéro-Sport, Luxembourg's leading flying associations. As Melilla can only accommodate a small number of planes, we had to limit the size of the group. Early morning departure in Luxembourg to Beziers (LFMU), with overnight stay nearby the airfield in Béziers. Great friends, great adventure ! 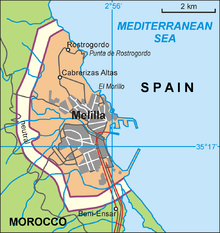 "Melilla is Spanish autonomous city located on the north coast of Africa, sharing a border with Morocco, with an area of 12.3 km2 (4.7 sq mi). Melilla is one of two permanently inhabited Spanish cities in mainland Africa, the other being Ceuta. It was part of the Province of Malaga until 14 March 1995, when the city's Statute of Autonomy was passed. Melilla has their own and well equipped modern airport of 1.428 meters lenght, The airport does not handle large jets, but following the extension of the runway, the airlines serving the airport also use medium size jets airplanes." This fortfied city has a special atmosphere, it looks a bit like West Berlin in the 80's with checkpoint Charly included. Yes, Ceuta and Melilla are integral parts of Spain. Thus, they are also part of the Schengen Area. The Schengen acquis fully applies to these cities. Entering or exiting Ceuta is entering or exiting the Schengen Area. This is a unique opportunity to discover this unique place in Europe, which is for more than 500 years Spanish territory. What about the hotels ? We have booked some rooms in France for May 1 and May 4 and a topp hill hotel in Melilla for May 2-3. Always a group rates between 70 and 100 € a night. There might be a deposit to pay, details to be announced.